A Straighter Smile » Quick Straight Teeth – The Results Are Clear! Quick straight teeth uses clear ceramic brackets to replace the unsightly traditional metal traintracks. These have a reliable and proven track record worldwide for their performance and beautiful aesthetics, being nearly invisible once placed in the mouth. Simon also use bespoke tooth coloured wires making these braces the most aesthetic compared with any similar systems available on the market today. The braces are traditionally only used on the front 6 or 8 teeth, to correct mild misalignment and give you a beautiful smile. Standard orthodontic mechanics are still involved in the use of QuickStraightTeeth™, but because it’s just the front teeth, the force required is minimal. 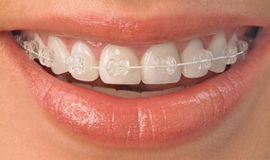 The wires exert mild pressure to move the teeth, and this is done without the need for severe tightening which causes the discomfort noted in conventional orthodontic treatments. Quick Straight Teeth – The Results Are Clear!